Every book on index investing stresses the importance of asset allocation: the percentage of equities and fixed-income investments in a portfolio. Of course, more stocks means more risk but higher expected returns, while boring old bonds provide safety and promise less growth. But just what is the long-term difference in risk and returns between stocks and bonds? How does a 50-50 portfolio compare with one that holds just 20% bonds, or 20% equities? Paul Merriman, who runs the Seattle-based investment firm that bears his name, recently wrote an article that included a table of historical stock and bond returns going back to 1970. It compares the performance and risk of portfolios with various stock-bond mixes. The returns are hypothetical, but they represent a reasonable estimate of what you might expect from a portfolio of low-cost index funds that track the broad markets. There are a couple of lessons in these numbers. First, if you’re saving for the short term—say, five years or so—think carefully about how much you invest in stocks. Even a 50-50 portfolio can lose money over a five-year period, and in 2008–09 that allocation would have lost 28.5% in just 12 months. Meanwhile, the worst five-year return for an all-bond portfolio was 14.1% (or 2.7% annualized), and you’d never have lost 5% in any year. That’s something to keep in mind if you’re saving for a child’s education, or a down payment on a house. You’ll also notice that a portfolio of 20% equities—which most investors would consider extremely conservative—produced an annualized return of 8.2%. Many people would find that sufficient to fund their retirement. Admittedly, you would have had to weather some five-year periods of dreary returns, but even the worst of these saw 10.1% growth (1.9% annualized). The 20-80 portfolio never experienced a one-year loss of more than 11.6%. By contrast, even a plain vanilla 60-40 portfolio is vulnerable to losing a third of its value in 12 months. The take-away here is this: figure out the rate of return required to meet your financial goals and take only as much risk as necessary. Let’s say you’re putting $200 a month in an RESP for your five-year-old daughter with the goal of saving $50,000 by the time she’s 18. You’ll meet that target with an annual return of just 5%. If you’ve got $100,000 in your RRSP and contribute $5,000 annually, you need 8% returns to retire in 25 years with a million bucks. If the last 40 years are any guide, both goals may be achievable with a balanced portfolio. Interesting, but I think ultimately somewhere deceptive in the presence of inflation. It not the absolute return that matters, but the real return. And of course, inflation, like returns, aren’t a straight line. There will be a high correlation between bond returns and inflation, which I think makes the bond returns look better on this chart than they really are, and consequently makes the spread between the 100% bonds & 100% equities less than they are in real terms. The other factor is compounding. Even a 2% annual difference in returns will have a huge affect on the end result after a couple or more decades. I am a big proponent of this style of investing, but his chart reminds me of the “lies, damn lies, and statistics” continuum. I don’t think I’m going to shift my allocations any further towards bonds based on this chart. 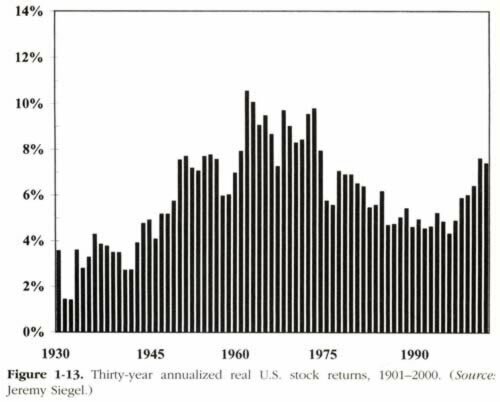 Does anyone know of a source for a “real-returns” chart? Doing all that math myself seems counter to my couch-potato ways. One interesting thing you’ll find in Norbert’s data: the average real real return on Canadian bonds between 1980 and 2008 is 6.6%. The average real return on Canadian stocks over the same 29 years was 6.2%. Those numbers are skewed by the horrendous bear market of 2008, but compelling nonetheless. If we look at the REAL return tab of the Excel file from the link to Libra Investment Management, the comparison is really interesting. If one invested $100 in 1980, the all stock investment (TSX Composite) would become $539.04 in 2009 using percentage returns from 1980 to 2009. However, the All Canadian Bonds would give this investor $622.34 for the same 30 years. The Long Canadian Bonds would even grow to $832.42!! Maybe we should switch to bonds. Thanks for another informative and valuable post. Despite my generally high risk tolerance, I’ve been building up the bond portion of my portfolio over the past year since I’m now about 15 years from retirement age. One very basic question about bond indexes (I currently use the TD eSeries bond index fund): when it comes time to transfer these out of my RRSP and start withdrawing money during retirement, are there restrictions on when I can withdraw based on the maturity dates of the various bonds in the fund? I don’t really understand how bond index funds work: can you cash in your shares anytime, the same way you can with stock index funds? There are lots of questions like this that I haven’t thought about because retirement has been such a distant target, but now that my older siblings are in their 60s I realize that I have to bone up on stuff like this. Brad: Glad you found the post helpful. Bond mutual funds (and bond ETFs) can be redeemed at any time, just like equity mutual funds, so no need to worry about that. All mutual funds keep some portion of their holdings in cash for this reason. If there happens to be a huge sell-off in a short period (i.e. a panic), then the manager will sell some of the bonds in the portfolio to raise the cash. I hope I didn’t imply that stocks are somehow inferior to bonds! But it’s true that bonds often get a bad rap, especially in times like this when their yields are pitiful and interest rate hikes seem inevitable. The original Couch Potato portfolio that Scott Burns created in 1987 was 50% bonds and 50% stocks. Turns out that ultra-simple portfolio would have done extremely well in both the US and Canada. I wonder whether anyone actually followed the advice and held on for 23 years. Another great post CCP. What this tells is again is that risk and return at two sides of the same coin. That 28 year time period would probably be an outlier comparied to other “28 year” periods. It doesn’t amount to much statistically, and would consider it unlikely to happen again. I recall Dr. Bernstein doing a similar 30 year total return analysis since 1928 in his book Four Pillars. Thanks for the comment, Brian. I think it’s hard to call a 28-year period an outlier. The useful market data we have only goes back about 85 years, so 1980-2008 covers about a third of the whole data set. Just another word of appreciation for the informative and valuable post(s). 30 year annualized returns for the US large cap. The results there are opposite, with the mixed portfolio achieving superior returns over a 20 year period. I have a long investment horizon (30-35 years) and always have been, and planned to remain, all stocks until I read the post I linked to. Hi Alan: The two reports look at very different data. The Merriman numbers cover a 40-year period from 1970 to 2009. The post you link to looks at a 20-year period from 1962 to 1981, which the author specifically chose as the worst-ever 20-year period for US stocks. So yes, a diversified portfolio earned more than an all-stock portfolio during those 20 years, but in every other 20-year period, the all-stock portfolio would have returned more — with correspondingly more risk, of course. This link may be helpful for calculating how much you will need in retirement. Dan, or anyone else, have you found any other calculators that are more helpful?